Exterior lighting adds a number of benefits to a home. It makes an outdoor space more functional, allowing a garden to be used at night. Ideal for late summer nights. Once the outdoors has an exterior lighting design, it will create a scenic view that can be enjoyed even when viewed inside. This allows the beauty of the property to be showcased at night. More lighting outdoors also adds security to a home. When all of this is added up it will also boost the value of the property. Though it can be complex to set up exterior lighting, or landscape lighting, with all the electrical wiring, there are other options to make it easy. Through the use of solar garden lights, DIY outdoor lighting is possible. Making it easier to add value, visual appeal, and security to a home. Exterior lighting design needs to have some thought behind it. When done right, it provides all the benefits mentioned above, when done wrong an outdoor space can become washed out with imposing shadows casted all over the place. Also, when it comes to buying outdoor light fixtures, it is key to invest in them. They need to be durable, and shine brightly. While cheap ones will just add costs and wont do your outdoor space any justice and bring the added benefits of exterior lighting. When you are installing lighting fixtures outdoors, you will either be using a line voltage system, low voltage lights or solar exterior lighting. Line Voltage is when your outdoor lights are installed and connected to your homes 120-volt AC power grid. This type of lighting provides the brightest form of lighting. But because of the high voltage they are not as safe, are much more expensive, and less energy efficient than the other two options. Low-voltage lights are also connected to a homes electrical works but first go through a transformer. This transformer turns the current into 12-vol allowing you to install low-voltage lights. The easiest and most cost effective exterior light fixtures are solar powered garden lights. They are cheap to purchase, and very simple to install. Because they do not require any wiring they can be placed anywhere you like – anywhere under direct sunlight. The technology has advanced to make solar garden lights shine brighter and longer. They are able to absorb the suns energy more efficiently. As more people are turning to alternative energy forms such as solar exterior lighting, the range of solar garden lights has expanded from the shapes, styles, and to the sizes. There is also the added benefit of not needing to install a timer or having to turn the lights on or off as there is a light sensor on top of every solar light. A modern exterior lighting plan is made up of layering lighting. There are three types of exterior lighting uses: Accent, Task and Ambient. The most important form of modern exterior lighting is task lighting. This is because it allows the outdoor space to be functional and adds security. The entrance of your home is the most important area for outdoor lighting, making it the first area to focus on for task lighting. 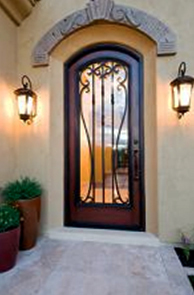 Lighting up your entrance will provide a warm welcoming. The best lighting layout is to have a light on each side of the door. Whether it is two sconce lights or hanging lanterns. It is best to find light fixtures that are the right sizes, as too big and it will overpower the doorway, and too small will make the entrance look distorted. A good rule of thumb is to look for fixtures that are about 1/5th the size of the doorway. Leading up to the doorway: paths and driveway lighting is next. Lighting these areas enhance the safety and visual appeal. This will also include stairs to patios and deck lights. Post lights are commonly used to light up pathways. These will include a shade at the top of the post to direct the light downwards. A recommended option would be to use ground stake solar lights. They easy to install as all you need to do is to push them down into soil. They are very versatile as you can move them around where you like and find them in tall or short sizes. When it comes to lighting pathways for decks or patios, recessed lights are an elegant form of modern exterior lighting. These are ideal for outdoor stair lighting as the lights are fitted flushed into the steps and deck itself and shines light upwards. By just having any exterior lighting will add security, as the outdoors are lit up, making it uncomfortable for potential intruders. But motion sensors are a great addition. There are standard electrical motion sensor lights. Another simpler option is to use motion detector solar lights. They are energy efficient and can be installed by anyone. They need to be placed in areas under direct sunlight, around the front door, back door and garage. If there is something outdoors that you want to showcase, or be the focal point of the garden, then accent lighting is what is used. Areas or objects that are usually highlighted are: trees, shrubs, the swimming pool, fountains, or outdoor décor such as sculptures. By using accent lighting you can create an amazing view with the focal points and play on the shadows. When it comes to accent lighting, you will need to look for light fixtures that are bright and have a focused point, like a spotlight. When it comes to highlighting trees (other focal points in the garden), there is a technique that can be used called ‘cross lighting’. This is when you use more than one light to shine on the tree, lighting it up on multiple sides. Another technique is to do backlighting, where you place the light fixture behind the object, and this creates a silhouette. Up-lighting is a third option. This is when the light is aimed upwards towards the piece you want to highlight. Up-lights can come as stake lights or well lights. Solar spot lights are also an ideal option to use for accent lighting. Because of the lack of wiring, they can easily be placed anywhere in the garden, and be used to highlight a tree, sculpture, shrub, or any landscape feature. If task lighting and accent lighting is not enough to layer the garden with enough light, then additional lights will be needed to provide the right amount of lighting. Decks and patios, swimming pools, ponds, out of the way areas in the garden, and walls around the house will most likely need additional lighting to fulfill the layering needed. Outdoor string lights are commonly seen and bought for Christmas festivities, but they can now be found in elegant forms. Instead of the traditional red and green flashing lights, they come in a range of white and off white hues, with large bulbs, and some come with a lantern shade. They can also be found in solar powered form, making them ideal for exterior lighting on patios, and used for lighting paths. Rope lights are different than string lights. A form of LED exterior lighting where multiple LED lights are encased within a plastic tube to form a rope of lights. These lights are highly versatile (especially when solar powered) and can be used to light patio and deck railings, outlining garden areas, hung on fences or even wrapped around trees. A highly elegant exterior lighting idea is to use floating solar lights. Used for adding ambient lighting within a pond or swimming pool. The light is reflected off of the water surface, creating an elegant scene. Moonlighting is an uncommon exterior lighting design feature, reserved for gardens with high trees. When lights are placed high among the treetops, they will cast a moon-like light around the garden. Exterior wall lighting: it doesn’t have to be as complicated as it sounds with solar powered wall lights, but there is still the option of electrical light fixtures. 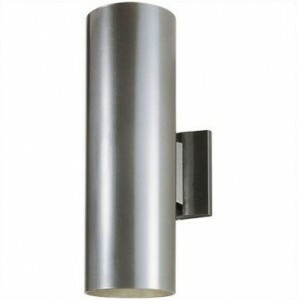 Sconces provide a modern exterior lighting look when used for ambient lighting around the house. While hanging lanterns add a more traditional style. Wall lighting can be merged with outdoor wall décor. A wall fountain or wall sculpture fixed with a light will create a focus point within your landscape. Tiki torches are also ideal for adding ambient lighting. They come in a range of styles to suit the informal garden setting, or a formal manicured landscape. For the informal setting you can find kerosene and oil tiki torches, which are easy to buy at any department store, Amazon, or even a Wal-Mart. These torches just require a filling up of fuel, you can even find ones that are fueled by citronella oil which repels insects. For a more formal garden, there is the option to install gas fueled tiki torches. The benefit of this is that you can control the flame from a valve and there won’t be a need to be replace the oil. But you will need to install underground piping connecting the torches to the gas source. There are permanent tiki torches, made from metal, that are elegant looking that don’t require any gas piping as they are oil fueled. All the mentioned above fixtures can be found in a range of different styles to suit the architectural look of your home or the look you want to create for your home. You are not limited by the look of your home. If you have an old home, modern exterior lightening fixtures (more minimalistic in style) strategically placed will contemporaries the house. Decorative outdoor lighting ideas and fixtures (elaborate and stylized fixtures) can be used on a plain house to enhance the look. Tropical: use of natural elements (wood, stone), tiki torches, etc. 1. It is possible to over light an outdoor space (light fixtures need be layered to create a canvas of lighting). 2. The lighting does not have to be evenly layered. There are focal points in an outdoor space, and these will have more lights focused on them. Areas of little interest will have a lower amount of lighting. 6. When going about path or driveway lighting, alternate the side on which you place the lights, otherwise having the lights directly opposite from each other will create a ‘runway’ effect. 7. Lighting watered areas such as ponds or a swimming pool is a great way of creating a scenic view of your garden.